Search engines, such as Google and Bing, send crawlers all over the Internet to index all the words and terms used in the content on websites. Their complex algorithms not only decide what your site is about, they also evaluate the quality of your content, how long people stay on your page, and many other factors, including social engagement, to determine where your site should rank in search engine results pages (SERPs). Each search engine has a unique algorithm for ultimately ranking pages, but they all start by indexing the pages and identifying keywords. If you want to attract people to your website, you need to rank well in SERPs, so the right people can find you. Keywords are the tools you use to make your website rank high in search results, so finding the right keywords is crucial to success with search engines. It’s important to use a variety of keywords that your target customer is likely to search for and that set you above your competitors. That’s the essence of SEO, but with the increasing sophistication of search engines and the volume of content on the internet, you can’t simply rely on guesswork to decide what keywords to feature in your content. Today, you need to identify your keywords first and then create your content around them. Fortunately, there’s an easy way to decide what your keywords should be. HubSpot has a keyword tool that will help you select the best keywords for your site in a few easy steps. Start by deciding what your business is really about. Pick three or four high level concepts and use them as column headings in a spreadsheet or document. Brainstorm related concepts or phrases that you think your customer might type into a search engine and add them under each column. Or take the easy route and use the HubSpot tool to suggest related keywords and phrases. 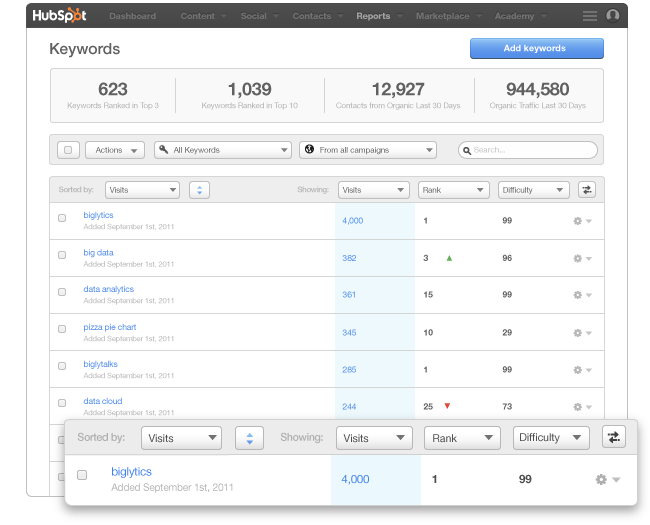 Once you have a comprehensive list, the HubSpot Keyword Tool will help you determine how each keyword performs. It can show you how often people search for the term and how it ranks in search results. Use additional data from the HubSpot tool to narrow down your list to a manageable number of the best performing keywords to attract search engines. Use data such as the number of visits and historical performance as tiebreakers. You can find out which terms the competition is using, and how those keywords perform for them using the HubSpot Keyword Tool. You will probably want some overlap in keywords, but you don’t want identical lists. You can use the data about competitors to help form your own content strategy. Continue using the HubSpot Keyword Tool to measure how the keywords you chose perform over time. Keep fine-tuning keywords and your content until your site ranks near the top of the list. Many marketers learned about keyword usage in the early days of the Internet. Back then, it was all about how many times you could stuff a keyword onto the page. However, keyword usage in SEO isn't the same as it was even a few years ago. You can’t simply focus on keyword density and hope to achieve solid SERP results. Read about cringe-worthy mistakes companies are still making with keywords. Although the goal of SEO is to rank high on SERPs, search engines don’t actually buy products. Only people buy products, so you will want to be sure that the content you post is attractive and engaging for humans too. Otherwise, those people will quickly leave your site – that’s called a bounce -- and a high bounce rate will hurt your rank. Over time, if prospects find your content lacking, they will stop following links to your content, which will be another hit to your rank. So avoid keyword stuffing, awkward use of your keywords or making every post about selling your product. Create lively, valuable and engaging content that’s keyword rich but also of value and interest to potential customers if you want to achieve your goals. The next step is to develop a strategy to generate content that supports your keyword themes. Definitely monitor your keyword performance, but always use keywords naturally in your content. To be successful today, you need a tool such as the one HubSpot provides to help identify your best possible high-search-volume keywords.